We made another run to the coast from Bakersfield in our 2017 Chevy Bolt. This was a business trip. I had a half-day lecture to give at CalPoly in San Luis Obispo. So there was no dawdling to take pictures of wildflowers or poking along at a modest speed to conserve our charge. We drove there, charged, spent the night, gave my talk, and drove back. Again, I used two different electric vehicle (EV) trip planning web sites: EV Trip Planner and GreenRace. I've written about both before. See the links at the end of this article. EV Trip Planner doesn't have a specific pull-down tab for the Chevy Bolt, but it does have two for the Nissan Leaf: Alpha, and Beta. GreenRace has tools for two versions of the Nissan Leaf (24 kWh and 30 kWh) and one specific to the Bolt. There was a noticeable tail wind on the 145-mile drive over and we arrived with 41% charge remaining. We consumed 35 kWh--nearly the same amount as on the previous trip. This was about 10% less than the estimates by GreenRace for the Bolt and by EV Trip Planner for Leaf Alpha. GreenRace's estimate for the 30 kWh Leaf was on the money for this trip. We spent several hours in Grover Beach visiting a friend. 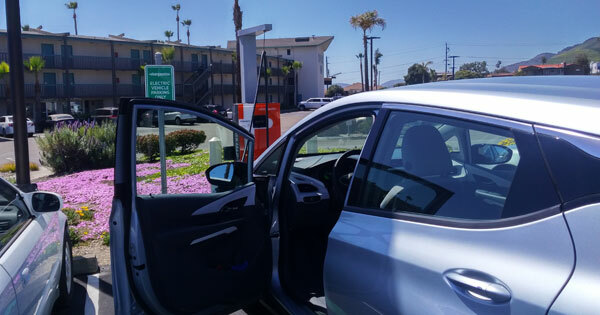 This allowed us to park the car at Kon Tiki Inn's ChargePoint 24 kW fast charger. 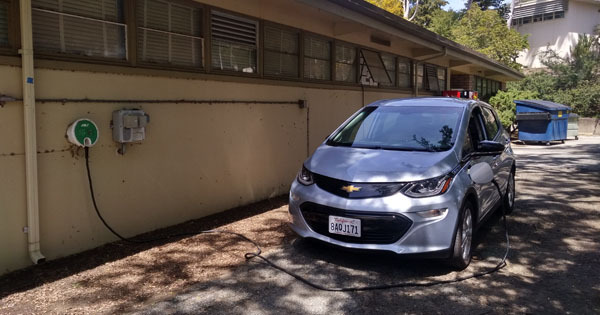 The charge station delivers 22 kW to start, drops to 20 kW, ramps back up to 22 kW before ramping down as the battery controller begins to taper the charge. With the parking fee and the startup fee, the charge wasn't cheap: $21.59 for 36 kWh. Yet it was worth it to me as I would be on a tight schedule the next day. As fortune would have it, the next day I found an old Level 2 Aerovironment station right at the door of the Electrical Engineering Department where I was speaking. It's not shown on PlugShare because it's limited to faculty in the department. Faculty member Dale Dolan moved his Chevy Volt so I could pull in and top up. At the end of the day I had a full charge for the drive back to Bakersfield. It was a long day and we had a three-hour drive back to Bakersfield from CalPoly. I drove the Bolt like I'd drive a gasser when my only intent was to get from point A to point B. 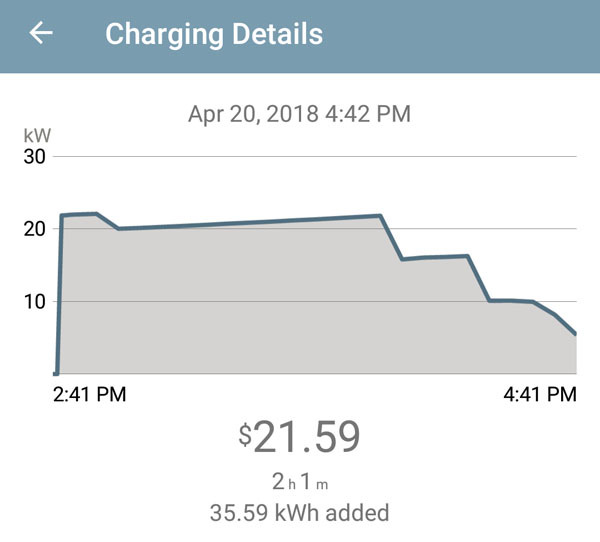 We had a full charge. I knew we had ample battery capacity for the trip, so I drove hard. I overtook slow moving vehicles several times. I more than stayed up with traffic. On the trip back to Bakersfield we had to climb over both the Questa Grade and the Temblor Range. Despite driving the Bolt hard, we pulled into Bakersfield with 40% charge remaining on the 140-mile leg from San Luis Obispo. We consumed only 37 kWh on the return, well below estimates by EV Trip Planner for the Leaf Alpha, and well below estimates by GreenRace for the 30 kWh Leaf and the Chevy Bolt. There was no noticeable wind on the drive back, however, temperatures were in the low 90s (~32 C). It appears we can expect a drive to the coast from Bakersfield and use about 36 kWh and on the return use from 37 to 42 kWh. Having this knowledge gives me more peace of mind when traveling this route. However, it also reiterates that for long trips on untested routes, it remains best to use the more conservative estimates.